Cette grande maison construite juste au-dessus de l'eau où, à marée haute, on pouvait entendre le clapotis des vagues sous le plancher de la cuisine. Par Yacht ou Voilier vous pouvez naviguer jusqu'à la porte d'entrée et de sécuriser votre bateau au quai et avoir des services de la marina complètes. Little Harbour Brook est grand endroit pour regarder de toute fenêtre, le pont pour voir Salmon sauter les chutes à l'embouchure du lac Rencontre la gorge est la meilleure secret de parc national du Gros-Morne du café du matin ici est le meilleur. Le long de sentiers et de chemins Conseil du lac et des plages pygargues à tête blanche sont abondantes ici dans la baie Fortune même les pêcheurs se nourrissent ensuite. Chart House 1893 un caractère traditionnel et le nouveau confort et la cuisine de luxe pleine chef avec la gastronomie et la visualisation assis dessus de l'océan Atlantique Nord. Il ya trois chambres à coucher avec deux lits doubles avec salle de bains et des douches de demi propres. La troisième chambre se transforme en un studio complet ou un menu déroulant lit escamotable avec salle d'eau. Salon avec poêle à bois, Parlor avec Terre-Neuve livres jeux TV / DVD / VHS, même vieux tourne-disque de temps. Very unique special place literally built over the ocean on stilts. Comfortable, magnificent view ! Debbie and Paul were very special and generous hosts, meeting us 4 women hikers at the ferry and giving us a very thorough tour and history of Rencontre. Three days were packed with adventure from hiking around the pond, viewing schooner etchings in the rocks along another trail, bird watching (eagles and kingfishers in abundance), visiting the wonderful community gardens and meeting the very nice people in the community . We charted a motor boat that took us 5 miles down the lake and viewed the amazing fjord and Debbie treated us to wonderful dinner complete with wine. The last morning we went for a swim in that magnificent pristine lake surrounded by mountains. We all agree it was our ultimate swimming experience. Awesome hosts ! Every window in the house had the most amazing view and we all agreed that sitting out on the deck for 3 days would be just fine. We also had the opportunity to view the night sky when Mars was at it's brightest.and watch the full moon ascend over the mountains. Also a great place for star gazing as little artificial light. Thank you so much, Debbie and Paul and all the people of Rencontre East for being so welcoming and so much fun. The ferry ride, the remote location, the charming village, all are delightful. The house we stayed in is very well appointed, comfortable, and with a lovely view of the harbour and a waterfall. We opted for the half-day boat trip on the nearby lake. What a magnificent asset for this small community. There are no cars at the outport, just ATVs; thus, the ride from the ferry to the house is, for we ATV novices, great fun. We cannot praise Paul's hospitality too highly. If you want an out of the way adventure in a seriously remote place, this is it. The stars at night are fantastic. The quiet is amazing. The ferry ride is a blast. This is a small fishing village with no amenities besides a small store where one can by staples and beer. If you are writing a book or just want to get away from city for some serious quiet time, book now! Yes! We did have a great week together and we created wonderful memories on our side as well People like you Guys is why we do what we do it’s our nature and our hearts to treat people nice and it rubs of one to another. A really great location to get away from it all and relax. Charming house, well fitted out with everything you could possibly need and very welcoming hosts. Well worth the effort of getting to this isolated spot. Our visit to Rencontre East was unique, beautiful and invigorating. Unique in that we had never visited a place with only quads and side by sides as a mode of transportation yet you could still feel the peace and tranquility in this little community. Beautiful because the scenery approaching, touring, hiking around and leaving was like no other. Invigorating in the fact that we did things that we hadn't done in many years such as jigging fish and feeling like you are on an adventure for the time we were there. Touring the salmon farms was very educational and informative as well as amazing to see. None of this would have been possible without Paul and Debbie making us feel at home from the time we arrived until we left. We couldn't stop talking about it to our friends and family and will return hopefully next year with some of them. Chart House met every requirement you could want or need. The only thing we needed to bring was our food. Once again I would like to thank Paul and Debbie Trickett for providing this opportunity to us. No doubt about it our Guest are special to us something about being small and providing the the attention our Guest deserves is very important to us to be able to spend that quality time here at Rencontre East . We thank you for your visit and looking forward to your returning. 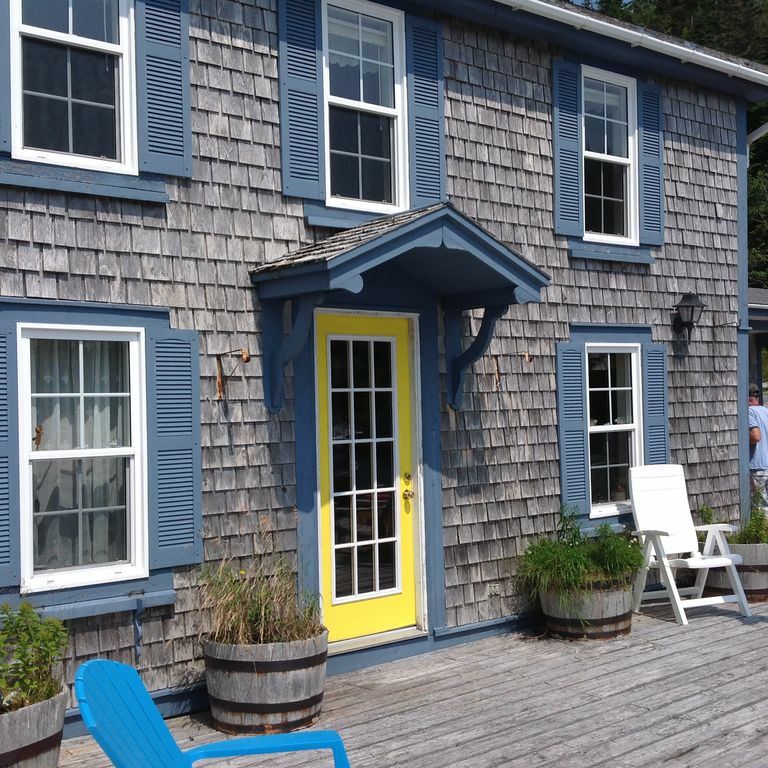 We visited 7 -9 July, two couples, and stayed at Chart House which is a beautiful old and historic property that is quiet literally on the ocean. Set in a small cove in Rencontre it is surrounded by the hills on three sides with the ocean just off its front door. Quiet, peaceful and incredibly captivating! The house has everything you need and is very comfortable. Our hosts, Paul and Debbie, were simply amazing in offering every convenience available and nothing was too much for them to offer or do. Their hospitality was the perfect complement to an amazing getaway. The town of Rencontre is a lovely community with the friendliest people you could ever want to meet. When we arrived on the ferry and saw the Welcome to Rencontre sign with its message "Isolated and Loving It" we knew that this would be a special place and great weekend. Thanks again to Paul and Debbie. You Guys were great Guest. enjoyed once again in your company and look forward in your return. Rencontre East est une petite communauté, petit village isolé de Terre-Neuve-et-Labrador, Canada, situé au nord-est de Belleoram, et à l'ouest de la baie L 'Argent dans la baie Fortune. La population était de 136 en Septembre 2010. Cette petite communauté est pas connecté à toutes les zones environnantes par la route, mais est accessible par le service de traversier régulier. Toutes les routes sont saleté et VTT s sont la principale source de transport.